As I mentioned way back in Vol. 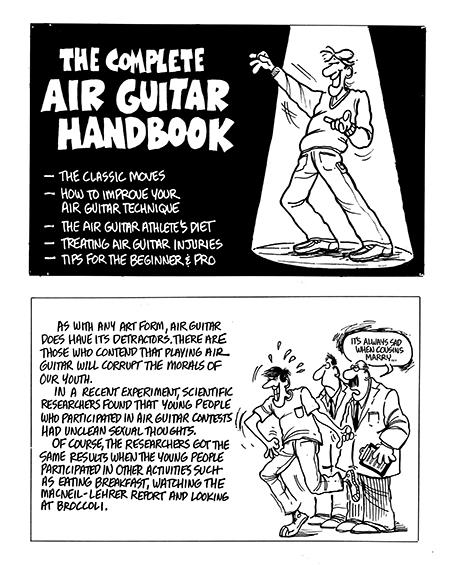 3, cartoonists tend to be somewhat of an insecure lot, so in an attempt to cover all the bases I took the air guitar idea one step further and wrote a small cartoon book “The Complete Air Guitar Handbook,” which a former Akron U student of mine, Pat Sandy, ably illustrated. Turns out it was such a good idea that someone beat us to the publishing punch with a similar book. No problem; I simply cannibalized my book for Crazy Harry’s Air Guitar Guide and ran it in the strip. Which just goes to show, I guess, that insecurity can come in handy.